It has been widely demonstrated that the health and wellbeing of workers are important contributors to the success of any business. As Queensland and Australia’s film, television and new media industries engage in a fiercely competitive global marketplace, the development of a flourishing OHS culture and high levels of workplace morale will deliver valuable competitive advantages to the industry. The ‘Safety Induction Blue Card’ introduced into the Construction industry in many states throughout Australia has proved to be successful. This initiative provides basic OHS competencies for all those working in the building and allied industries and must be attained by all workers. This OHS intervention is improving safety performance industry wide, and increasingly protecting the wellbeing of workers. With the adoption of national certification, OHS inductions in the construction industry will be harmonised across all states providing consistency, uniformity and integration. This paper examines the notion of introducing a Safety Induction Blue Card certification into the Queensland film, television and new media industry as a pilot project and precursor to national implementation. This strategy will assist address the OHS deficiencies noted above. This paper has been extracted for the report Risky Business: A Systematic OHS Framework for Queensland’s Film, Television and New Media Industries published in June 2008. Failure to manage occupational risk competently, or comply with occupational health and safety legislation, can jeopardise the attainment of business objectives, limit or negate profits, and inhibit business sustainability. Enterprises and individuals failing to manage occupational risk appropriately may also incur financial or custodial penalties. Some businesses may even be curtailed as a result of enforced closure or costly and ongoing litigation. It has been widely demonstrated that the health and well-being of workers are important contributors to the success of any enterprise. As Queensland’s film, television and new media industries engage in a fiercely competitive global marketplace, the development of a flourishing OHS culture and high levels of workplace morale will deliver valuable competitive advantages to this industry. The employment of an OHS risk-management program is a practical way of ensuring occupational health and well-being at work, and OHS training is an essential element of this process. Safety inductions are the major component of OHS training. low workforce morale in relation to OHS. A worker commented: ‘The carnal nature of this industry militates against safe practice. People are unprepared to ask for safe conditions in case they do not get employed again.’ Another worker commented, paradoxically: ‘There are no health and safety procedures [at work], but we do work in a healthy and safe environment.’ Other respondents expressed similar sentiments. These findings are reflected in other studies that have been conducted into the Australian film and television and media industries. In the report The Screen Production Safety Project, prepared for Create Australia,2 Glen Eaves draws attention to ‘guerrilla’ productions when he states: ‘Production methods employed in low-budget filmmaking are often the antithesis of professional industrial work practices and certainly are not lawful in terms of meeting OHS standards.’ Eaves goes on to point out that nationally, in many sections of the industry, unqualified technicians are employed to perform work covered by licensing regulations. Industry incidents are seriously under-reported and the industry is characterised by a lack of safety knowledge, particularly amongst the myriad of smaller production companies. The ABC is frequently confronted with safety issues concerning outside production companies using our facilities and sometimes our own staff, despite our best endeavours and our generally good safety record. A mandatory safety induction ‘Blue Card’ would go a long way to helping to better manage safety in the film and television industry. risks involved in working in hostile or emotionally charged environments. In a further report concerning training issues and other matters conducted by Peoplearn in Victoria,4 safety practices are cited as a major current concern for the sector. It is apparent that poor OHS management is not confined to the Queensland industry alone. Clearly this is a National problem. qualitative, open-ended questions that allowed for individual and discrete responses. Those responding to the survey were 51 per cent male and 49 per cent female, with one-third of all respondents in the 20–30 years age group. Significantly, 46 per cent of all females were in the 20–30 years age group, with only 21 per cent of all males in this same group. The reverse proportions existed in an older group, with 21 per cent of all male respondents and only 5 per cent of all females being over 50 years of age. Industry workers under 40 years of age are predominantly female and those over 40 are predominantly male. Females appear to be entering the industry in greater numbers than males. Nearly half of those responding to the survey (49 per cent) described their employment status as self-employed, while 6 per cent said they were unemployed. Those claiming employment status worked on average 184 days during the year 2004–05. Table 1 shows a breakdown of respondents according to discipline and speciality. 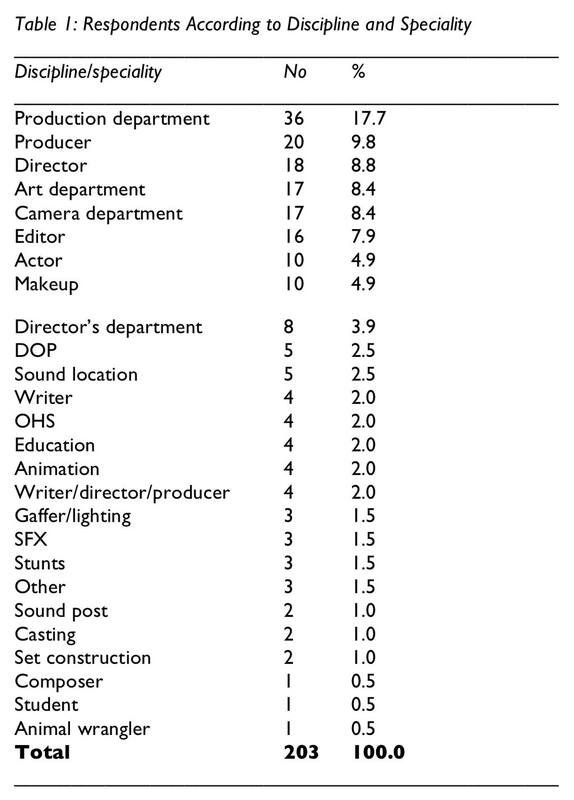 Significantly, producers and members of the production department represented one-quarter of all respondents to the survey. Six participants failed to respond to this survey question. It became clear during this study that the Queensland industry, although small in scale with approximately 224 businesses employing 2145 practitioners,6 is complex and diverse. The industry ranges from medium-sized enterprises employing over 100 workers to many small units of one to three people. Approximately half of those working in the industry are freelance practitioners or sole operators. Occupations are also diverse, with workers skilled in management, writing, fabrication and construction, digital compositing, animation, accounting, law, business management, cinematography, broadcasting, performance, costume, hairdressing and makeup, the electrical trades, pyrotechnics, marketing, music composition, animatronics, video editing, legal, accounting and many others. Few industries encompass such a diverse array of disciplines, fields and specialities. Although competently managed in some larger, established enterprises and by a number of sole operators, OHS practices in Queensland’s screen industry are often erratic, poorly managed or non-existent in smaller start-up and under-capitalised business. It is also clear that the industry currently lacks a uniform OHS system designed to ensure a primary level of OHS practice. It should be recognised, however, that except for isolated circumstances (e.g. collaboration between Workplace Health and Safety Queensland (WHSQ) and Warner Roadshow, and initiatives by QPIX) there have been few schemes initiated to assist Queensland’s screen industry improve its OHS performance. Education and training were clearly regarded as the most important of fourteen suggested interventions, and encouragingly, 97 per cent of participants stated that receiving OHS information and training was important. Ninety-two per cent said they would participate in training if it were provided. The implementation of a general safety induction Blue Card was viewed by industry focus groups as the scheme most likely to positively change OHS practice in the Queensland industry. Participants believe that this initiative will provide valuable foundation skills in OHS risk management, and underpin any further OHS strategies implemented in the future. In addition, the adoption of a general safety induction Blue Card will send a broad message to the industry that safe practice is a basic and essential element of work and should be included in all phases of production. The recent roll-out of compulsory safety induction training in Queensland’s construction industry has delivered enhanced safety performance in that industry. To work at a construction site in Queensland, a worker must possess a safety induction Blue Card. This card certifies that the worker has successfully completed a basic safety induction course provided by a Registered Training Organisation (RTO). Similar induction training takes place in New South Wales and Victoria, with mutual recognition of the qualification across the three states. The harmonisation of construction industry safety induction training in all Australian states will occur at some point in the future and will be based on a national training model and accreditation. Due to the success of the construction industry initiative, the Workplace Health and Safety Board (WHSB), the peak body governing Workplace Health and Safety in Queensland, has recommended that Workplace Health and Safety Queensland (WHSQ) ‘Investigate the feasibility of introducing workplace health and safety induction training’8 into all industry sectors. This recommendation includes the film, television and new media industries. The employment of a general safety induction Blue Card in Queensland’s screen industry will provide the cultural change required to stimulate improvements to OHS practice. In addition, this strategy will form part of a harmonised federal scheme that will lubricate the interstate migration of ‘film’ workers, and deliver a standardised and reliable general level of OHS competencies nationwide. All industry workers (both current and new) will be encouraged to undertake a basic and appropriate OHS induction course prior to commencing work. This course will be modelled on the existing 30215QLD employed in the construction industry in Queensland with demonstrated success. Further iterations of the course will be modelled on the evolving national course providing harmonisation across all Australian states and territories. Producers and employers give employment preference to Blue Card holders over non-holders. The Blue Card will assist in improving the overall OHS performance of the industry by providing foundation OHS competences. Business costs such as lost time, lost skill, insurance premiums, accident investigation and reporting and litigation will be reduced. Producers and heads of departments will be able to assume a basic level of safety knowledge and competency when engaging workers. Producers will no longer be required to incur the cost of providing general safety inductions. Although general safety inductions do not negate an obligation to provide site-specific and procedure/process inductions, they do provide a solid grounding that adds value to these additional prescribed inductions. Business owners and freelance workers will be rewarded by increased performance, profit and business sustainability. This report proposes that a parallel general safety induction Blue Card and accredited courses be introduced in Queensland’s screen industry. appropriateness and relevance of course. improving profit and sustainability of businesses. The cost of setting up a safety induction framework in Queensland will be minimal, with support provided by Workplace Health and Safety Queensland, Safe Work Queensland, the MEAA and Griffith University. Costs associated with the design of course curriculum and content; course implementation, accreditation and delivery will be met through an existing grant provided by the PFTC and Griffith University, and the participating Registered Training Organisation (RTO). industry participation in a review of the initiative at the conclusion of the trial period. The costs of acquiring a Blue Card will be approximately $60–70. This includes attending a four- hour course provided by an RTO or delivered online, course materials and certificates. The certification will be valid for a three-year period. Courses will be offered either by attendance at a training centres or through online delivery, thus providing workers with flexible arrangements for attaining certification. Work patterns and engagements in the film, television and new media industries are similar to those found in the building and construction industry. In both industries, a mix of permanent employment, contract, sub-contract and day-labour are used. For instance, a sub-contractor working on a construction site will have similar patterns of work and conditions to those of a sub- contractor working on a motion picture film or television series. The portability of safety induction certification, with its underlying assurance that the holder has acquired basic OHS competency, has added value to the OHS environment in the construction industry. It also provides higher levels of confidence when employing and managing a transitory workforce. These same benefits can be delivered to Queensland’s screen industry, its workers and employers. It is proposed that safety induction Blue Card certification operate (initially) through self- regulation rather than by enforcement and legislation. In Queensland, agencies such as the PFTC, QPIX and the MEAA, industry representative groups such as the Queensland Screen Industry Council and Filmmakers Guild and professional organisations such as the ACS, SPAA and Directors Guild can promote the initiative. As the benefits arising from the scheme are increasingly recognised, employers and producers will progressively insist that employees and sub- contractors possess a general safety induction Blue Card. Those who have participated in previous safety induction courses have made the comment that they have often been too general in character, with little consideration for the work activities that take place in the film, television and new media industry. While these general safety induction courses are required to be generic in content, a focus on specific industry practice should be accommodated. The film, television and new media industry should be consulted when designing courses. The Workplace Health and Safety Board of Queensland (WHSB) have established a goal to investigate the practicability and advantages of introducing compulsory general safety induction training into all industries. In order to move this proposal forward, Workplace Health and Safety Queensland and the Retail and Wholesale, Industry Sector Standing Committee (ISSC) will conduct a pilot study to investigate the feasibility of this initiative from September 2008 to August 2009. The film, television and new media industry sector (represented by the Retail and Wholesale ISSC) has been chosen as a vehicle for this pilot study, which is set out in the ISSC’s action plan for 2008–10. delivery of mandatory general safety induction courses to the Screen Industry. 1 Oughton, N. 2005, ‘Film and Television Production: A Risky Business’, Journal of OHS Australia and New Zealand, vol. 21, p. 23. 2 Eaves, G. 2004, Screen Production Safety Project, Create Australia, Melbourne. 3 ACIRRT 2005, OHS for Media Workers, report prepared for Media Arts and Entertainment Alliance, NSW, University of Sydney, Sydney. 4 Verve 2004, ‘Film, TV, Radio: Major Change Drivers Impacting on the Sector’, Knowledge and Skills, September, Verve, Melbourne. 5 Oughton, N. 2007, A Systematic Occupational Health and Safety Management Framework for Queensland’s Film, Television and New Media Industry, Griffith University, Brisbane. 7 Verve 2004, ‘Film, TV, Radio: Major Change Drivers Impacting on the Sector’, Knowledge and Skills, September, Verve, Melbourne. 8 Department of Employment and Industrial Relations. 2008. Industry Action Plan 2008-10: Hospitality, Recreation and Other Services Industry, Queensland Government, Qld, p. 11. Nicholas Oughton has extensive experience in risk management and occupational health in the visual and performing arts. He is a leading researcher in these fields and has been widely published. In addition, he has wide experience in cinematography, has produced and directed several highly regarded educational films and videos and worked as a production manager on international prize-winning theatrical films. Nicholas has been involved in film and television education since 1978, developing numerous undergraduate and post-graduate degree programs. He has been a member of several industry bodies, including the Industry Sector Standing Committee, Arts Training Queensland and the Queensland Film Industry Council. He is an executive member of the Australian Screen Production, Education and Research Association (ASPERA), and senior lecturer and convener of Film and Television Production at Griffith University.